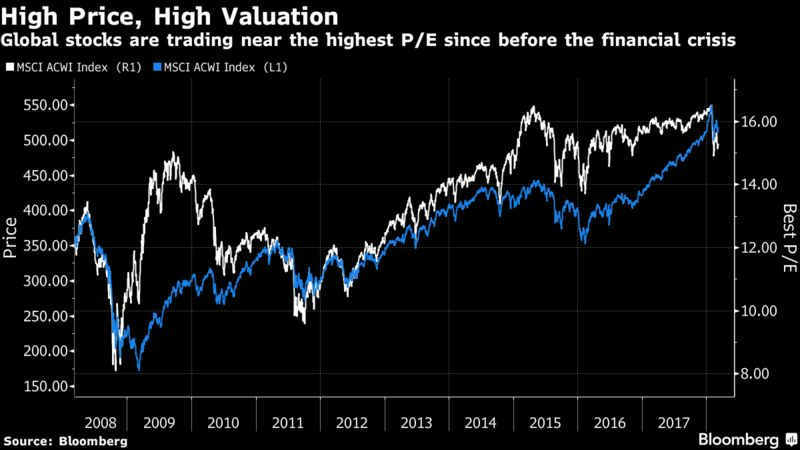 JPMorgan Chase & Co. executive Daniel Pinto warned equity markets could fall as much as 40 percent in the next two to three years. The benchmark S&P 500 Index has gained about 47 percent since February 2016. “We know there will be a correction at some point,” said Pinto, who oversees the trading and investment-banking unit at one of the largest U.S. banks. He said that markets are “nervous,” and if President Donald Trump goes beyond what he has already announced on steel tariffs, then investors could react badly. The prospect of a global trade war has had markets on edge, as Trump’s threats of steel and aluminum tariffs were met with talk of retaliation in China and Europe. JPMorgan Chief Executive Officer Jamie Dimon echoed Pinto’s concerns about tariffs. Last month, Pinto said trading revenue across his firm was on pace to increase by “mid to high single digits” in the first three months of 2018, with a spike in market volatility poised to help Wall Street firms break a three-quarter slump in that business. Pinto was promoted to co-president this year. The banker has advanced through the trading side of JPMorgan and has helped that business climb to the top of Wall Street. The firm was also the second-biggest by investment-banking fees last year, according to Bloomberg Intelligence. He’s spent his entire 35-year career at JPMorgan and its predecessors. Based in London, he was promoted to sole head of his unit in 2014, when Michael Cavanagh left.